Business cards tell a whole story in just a glance and are often the first and last impression especially when you're in a hurry. They tell everything about your business and more in just under a few seconds to begin with. With numerous businesses and saturated fields, it's the need of the hour to have a unique look on your biz card which complements your business's nature in order to make a stellar first impression and be easily memorable at the same time. Enter Die Cut Business Cards, a unique and nowadays-trending-approach to an otherwise boring ritual of handing and keeping business cards. With the unlimited shape possibilities, it's easier than ever even for your customers to identify and take out your business cards from their deck even without thinking consciously. These are a worthy investment considering how easy they make for you to stand out from the rest of the cards that your clients may keep handy with them. Together with our variety of premium paper stock, low minimums, unique shape possibilities, it's now easier than ever to stand out above the competition. We strive to produce cheap yet magazine quality custom shaped business cards that you will 'die' to hand out, pun intended. All the artwork, images, creativity, font, etc. boil down to one thing - how unique and memorable your business cards are? You definitely need a business card with its own unique personality to reflect upon your brand's image since nowadays, business cards are handed out so often in every industry that it becomes challenging to rise up above others and impose an unmistakably striking look. 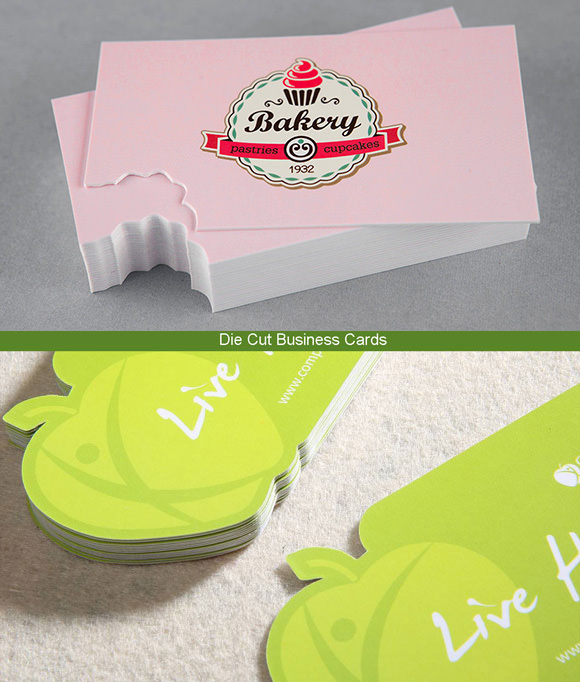 We are dedicated to making eye-catching and the best quality die cut business cards in Canada! Need finishings not available on the website? Simply contact us for a custom quote to get started!